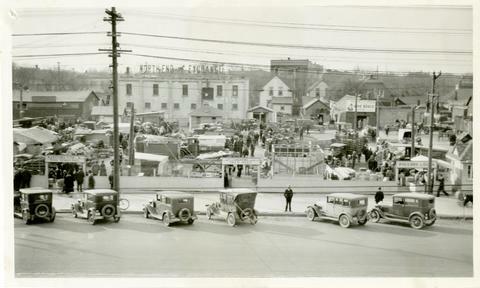 Photograph shows the North End Farmer's Market (west side Main Street, north of Stella Avenue, looking west to King Street). Included in photograph: front entrance to market, automobiles parked on street, and North End Horse Exchange (523 King Street). Photograph likely taken from 919-921 Main Street by city employee.